If you already have a lot of music and home videos in your iTunes library, you can easily stream it all to your Apple TV, and thus whatever output sources to which it is connected. For a media streaming device that is relatively long in tooth, the Apple TV has a lot going for it and at $69 it’s a good deal if you have an Apple-centric home. If you don’t currently own an Apple TV, then we recommend you try to hold off until Apple announces its next version (hopefully sometime this year). If you have already taken the leap, but you’ve never dug deeper into its capabilities then you’ll quickly discover that it actually does a great deal. You can connect it to your iCloud account and then use the device to display your photos as your screen saver or a slideshow, and such as with Chromecast, you can also do screen mirroring from your iOS device or your computer. 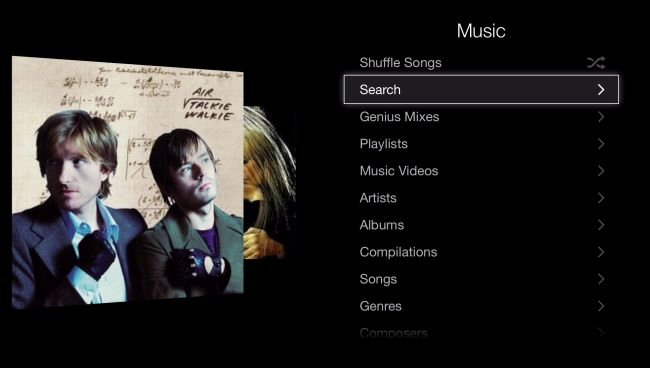 One of Apple TV’s biggest features, is that it integrates with iTunes, which means you can view and purchase content directly from the device in the iTunes store. If you already have a sizable amount of content stored locally on your computer, however, you can enable home sharing and play all of that on your Apple TV as well. At the heart of this is the Home Sharing feature, which can be enabled in iTunes from the “File” menu if you’re using a computer. If you’re stuck on this part and want a more detailed treatment of the process, please read up on how to share your iTunes library with your iOS devices. There are actually two aspects of iTunes integration in Apple TV. There’s the usual movies, music, and other content that you can purchase and play, and then there’s the “Computers” tile, which is actually your portal to Home Sharing and your private collection. If we maneuver over to the “Computers” tile, we see that we need to enable Home Sharing to access our personal iTunes library. 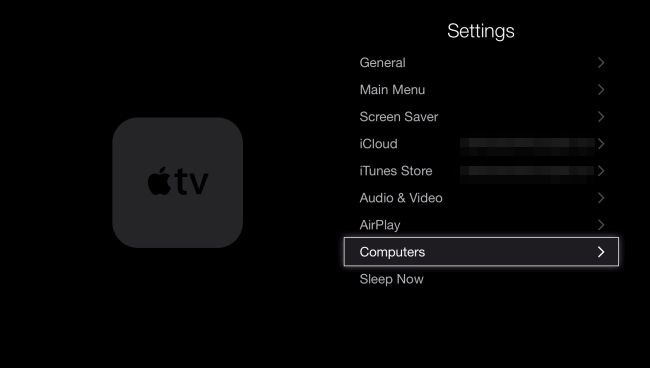 Click the “Settings” on the Apple TV’s main menu. To turn on Home Sharing, you need to click on “Computers” in the Settings menu. On the next screen, click “Turn On Home Sharing”. You have two options, you can use a different Apple ID, or the one you’re currently logged into on your Apple TV. 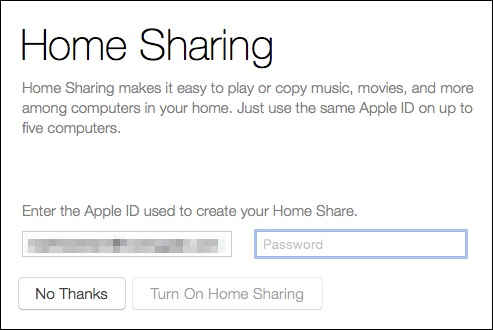 Remember, you need to connect to the same Apple ID account that all your other Home Sharing devices are using. Once Home Sharing is enabled, you’ll be shown a confirmation message. 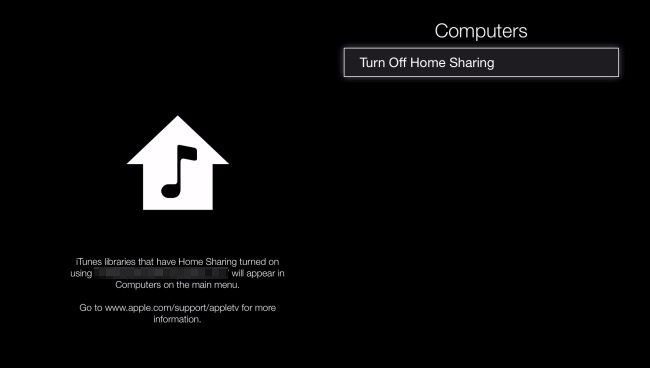 If at any point, you decide you don’t want to use Home Sharing on your Apple TV, or you want to log into a different Apple ID, then you will need to first turn it off and then redo the above procedure. With Home Sharing now enabled, we’re connected to the content stored on our computer(s). If we click the Computers tile, we now see options to access this content, including music, home videos, and podcasts. Here for example, you can search your music, access playlists, albums, and much more. With so many people adding higher end sound systems to their HD televisions, it makes sense to want to play all your media on it. Thankfully, Apple TV allows you to do that easily through iTunes Home Sharing. Best of all, you can access your collections from anywhere, so you can listen to your favorite podcast in the bedroom, or jam out to your tunes in the living room. If you already own an Apple TV, and you have a computer running iTunes, you can set this is up and start playing your music, videos, and other local content on your TV right now. Do you have any questions or comments you would like to contribute? We appreciate your feedback, so please leave it in our discussion forum.